*Courtesy of USF Libraries Digital Collections. Exhibition contributors include Project Director Dr. Sonia Labrador-Rodríguez, Associate Professor of Spanish Language & Literature; Humanities Librarian Theresa Burress; and Y. López Rodríguez. This database explores the rich heritage and current culture of Cubans, Mexicans, Puerto Ricans, Guatemalans, Dominicans, Colombians, Ecuadorians, and other Hispanic cultures in the United States. Access available for SCF students & staff, Log in with G00 number and last four digits of G#. PBS documentary about the 500th anniversary of the Hispanic presence in Florida and the United States. Magazines and articles in Spanish. Access available for SCF students & staff. Log in with G00 number and last four digits of G00 number. Información acerca de los servicios y reglamentos de las bibliotecas del Colegio "State College of Florida" en Bradenton, Venice y Lakewood Ranch. Cigar Co. Tampa label and other images in this page are courtesy of the USF Libraries Digital Collection. This exhibit and speaker series is part of a community project led by New College of Florida to build awareness in the Sarasota and Manatee communities of the deep roots that Cuban and Cuban-Americans have in this region of Florida, and to encourage community engagement with cultural, economic, and civic opportunities for Florida-Cuba relations today and into the future. Esta exhibición, y la serie de conferencias que se anuncia abajo, son parte de un proyecto comunitario iniciado por New College of Florida para educar a las comunidades de Sarasota y Manatee acerca de las raíces de los cubanos y cubano-americanos en esta área. Esperamos que también contribuya a estrechar los lazos entre Cuba y Florida mediante iniciativas culturales, económicas y cívicas que se generen a partir de estos eventos. We present the establishment of the Cuban community in Florida, beginning in the 1860s when cigar-factory owners moved an entire industry from Cuba to Florida and eventually settled in what is now known as Ybor City. The exhibit highlights the leadership role played by lectors, or cigar factory readers, in building the cultural, social, and linguistic community of Ybor. Images of Ybor yesterday and today provide a bridge from history to present day, and the series concludes with the unique stories of individual Cubans and Cuban-Americans who live in south-west Florida and contribute to our communities. Presentamos los comienzos de la comunidad cubana en la Florida, empezando por la salida de los tabaqueros cubanos en la década de los 1860, primero a Cayo Hueso, para finalmente establecer una nueva comunidad en Ybor City. La exhibición resalta la figura del lector y su contribución para crear una comunidad social, cultural y sobre todo, lingüística. Las imágenes de Ybor ayer y hoy enlazan el origen de la ciudad con el presente. La serie concluye con historias de cubanos y cubano-americanos del centro-oeste de Florida y su contribución a nuestras comunidades. COMMUNITY PANEL: WEST COAST FLORIDA / CUBAN RELATIONS: WHAT’S NEXT? New College faculty and Sarasota community members who have recently visited Cuba will lead a discussion of current and future economic, civic, and cultural opportunities. Panelists include international relations expert Dr. Nat Colletta, historian Dr. Brendan Goff, sociologist Dr. Sarah Hernandez, and journalist Johannes Werner, Editor of Cuba Standard and host of radio show Florida Caribe. Docentes de New College y miembros de la comunidad que visitaron Cuba recientemente presentarán una discusión sobre oportunidades económicas, cívicas y culturales en la actualidad y en el futuro. Panelistas incluyen Dr. Nat Colletta, experto en relaciones internacionales, Dr. Brendan Goff, historiador, Dra. Sarah Hernandez, socióloga y Johannes Werner, periodista, editor de Cuba Standard y locutor del programa de radio Florida Caribe. From the founding of Ybor City in 1886 to the dispersal of Tampa's Latin population in the years following World War II, this book documents the history of the Cuban, Spanish, and Italian immigrants who created the cigar industry in Tampa and the extraordinary multi-ethnic community that flourished around it. The practice of reading aloud has a long history, and the tradition still survives in Cuba as a hard-won right deeply embedded in cigar factory workers' culture. In El Lector, Araceli Tinajero deftly traces the evolution of the reader from nineteenth-century Cuba to the present and its eventual dissemination to Tampa, Key West, Puerto Rico, and Mexico. Melding history, literature, anthropology, music, culture, and sociology, La Florida is a unique presentation of the Hispanic roots that run deep in Florida's past and present and will assuredly shape its future. In the years since Fidel Castro came to power, the migration of close to one million Cubans to the United States continues to remain one of the most fascinating, unusual, and controversial movements in American history. María Cristina García--a Cuban refugee raised in Miami--has experienced firsthand many of the developments she describes, and has written the most comprehensive and revealing account of the postrevolutionary Cuban migration to date. Latino Americans chronicles the rich and varied history of Latinos, who have helped shaped our nation and have become, with more than fifty million people, the largest minority in the United States. Cuba's artistic tradition is as rich as its history, though its treasures are rarely appreciated outside of the country. This catalog, accompanying an exhibition at the Montreal Museum of Fine Arts, gathers paintings, drawings and photography from Cuba done over the past century and a half. In addition to hundreds of works on paper, it features revealing photographs'some never before published'that record the country's wars of independence and revolution, its utopian endeavours and social realities. 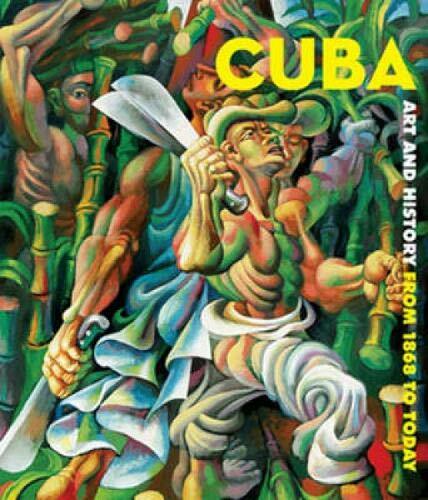 Numerous essays explore aspects of the Cuban visual arts such as nineteenthcentury landscapes and photojournalism, the burgeoning of the arte nuevo period, Wifredo Lam's seminal Africaninspired images, the creation of the famed collective mural, Castro-era poster art and the emergence of a new generation of artists. In this concise and up-to-date book, British journalist Richard Gott casts a fresh eye on the history of the Caribbean island from its pre-Columbian origins to the present day. He provides a European perspective on a country that is perhaps too frequently seen solely from the American point of view. The author emphasizes such little-known aspects of Cuba’s history as its tradition of racism and violence, its black rebellions, the survival of its Indian peoples, and the lasting influence of Spain. The book also offers an original look at aspects of the Revolution, including Castro’s relationship with the Soviet Union, military exploits in Africa, and his attempts to promote revolution in Latin America and among American blacks. In a concluding section, Gott tells the extraordinary story of the Revolution’s survival in the post-Soviet years. In this second edition of the widely hailed Cuba: What Everyone Needs to Know, Julia Sweig updates her concise and remarkably accessible portrait of the small island nation - and now includes material from her 2010 interview with Fidel Castro. The new edition covers the key events of the last fewyears: Raul Castro's assumption of power from his brother Fidel, economic and political reforms since Raul came to power, and the changes in US-Cuba relations following the election of Barack Obama. Expansive in coverage and authoritative in scope, the book looks back over Cuba's history since the Spanish American War before shifting to recent times. The story begins in the 16th century with the settlement of St. Augustine, Florida, when a sophisticated island with its jewel city Havana established its American links. In his book, author Guarione M. Diaz depicts the Cuban American experience by chronicling important events, examining pertinent facts (like the impact of Fidel Castro's revolution and rule), and portraying a vibrant community with a distinctive identity. For two centuries, Cuban exiles have found their way to the United States, especially to Florida. But since Castro's victory in 1959, Miami has seen almost one million Cubans arrive by sea and air. The impact on this area has been enormous. Miami---known as the "Exile Capital"---has a greater cultural affinity to Havana and the rest of Latin America than to Tallahassee, Florida's capital. Cuban Miami is the first analytical, photographic record of Cuban migration to south Florida. Robert M. Levine and Moises Asis have interviewed members of every sector of the Cuban exile community. In their wide-ranging investigation of Cuban-U.S. history, they touch upon all aspects of Cuban influence: politics, cuisine, music, assimilation, discrimination, and institution buildings. This completely revised and updated edition focuses on Cuba since Raul Castro took over the country s leadership in 2006. A Contemporary Cuba Reader brings together the best recent scholarship and writing on Cuban politics, economics, foreign relations, society, and culture in present-day Cuba. Ideally suited for students and general readers seeking to understand this still-contentious and controversial island, the book includes a substantive introduction setting the historical context, as well as part introductions and a chronology. A gathering of some of the best travel writing ever about the most intriguing hot spot in the Caribbean, this book includes work by Hemingway, Langston Hughes, Thomas Merton, Anais N•n, Frederic Remington, James Michener, Tommy Lasorda, and others. The Reader’s Companion to Cuba offers an infinitely more revealing and personal time-lapse “tour” of this complex country than could possibly be offered by any standard guidebook. Map. The freedom to roam is something that women and girls in Cuba do not have. Yet when Fredrika Bremer visits from Sweden in 1851 to learn about the people of this magical island, she is accompanied by Cecilia, a young slave who longs for her lost home in Africa. Soon Elena, the wealthy daughter of the house, sneaks out to join them. As the three women explore the lush countryside, they form a bond that breaks the barriers of language and culture. In this quietly powerful new book, award-winning poet Margarita Engle paints a portrait of early women's rights pioneer Fredrika Bremer and the journey to Cuba that transformed her life. The Firefly Letters is a 2011 Pura Belpre Honor Book for Narrative and a 2011 Bank Street - Best Children's Book of the Year. A journey in through the cultural coming of age experiences of the hyphenated Cuban-American. It exposes and brings into question the cultural contradictions and yearnings of childhood and adolescent experiences through poetic narratives. Finding Mañanais a vibrant, moving memoir of one family's life in Cuba and their wrenching departure. Mirta Ojito was born in Havana and raised there until the unprecedented events of the Mariel boatlift brought her to Miami, one teenager among more than a hundred thousand fellow refugees. Now a reporter for The New York Times, Ojito goes back to reckon with her past and to find the people who set this exodus in motion and brought her to her new home. She tells their stories and hers in superb and poignant detail-chronicling both individual lives and a major historical event. Daniel has escaped Nazi Germany with nothing but a desperate dream that he might one day find his parents again. But that golden land called New York has turned away his ship full of refugees, and Daniel finds himself in Cuba. As the tropical island begins to work its magic on him, the young refugee befriends a local girl with some painful secrets of her own. Yet even in Cuba, the Nazi darkness is never far away . . . Author Margarita Engle tells of growing up as a child of two cultures during the Cold War. Margarita is a girl from two worlds. Her heart lies in Cuba, her mother’s tropical island country, a place so lush with vibrant life that it seems like a fairy tale kingdom. But most of the time she lives in Los Angeles, lonely in the noisy city and dreaming of the summers when she can take a plane through the enchanted air to her beloved island. Then a revolution breaks out in Cuba. Margarita fears for her far-away family. When the hostility between Cuba and the United States erupts at the Bay of Pigs Invasion, Margarita’s worlds collide in the worst way possible. How can the two countries she loves hate each other so much? And will she ever get to visit her beautiful island again? It is 1896. Cuba has fought three wars for independence and still is not free. People have been rounded up in reconcentration camps with too little food and too much illness. Rosa is a nurse, but she dares not go to the camps. So she turns hidden caves into hospitals for those who know how to find her. Black, white, Cuban, Spanish—Rosa does her best for everyone. Yet who can heal a country so torn apart by war? Acclaimed poet Margarita Engle has created another breathtaking portrait of Cuba. The Surrender Tree is a 2009 Newbery Honor Book, the winner of the 2009 Pura Belpre Medal for Narrative and the 2009 Bank Street - Claudia Lewis Award, and a 2009 Bank Street - Best Children's Book of the Year. When Julian's parents make the heartbreaking decision to send him and his two brothers away from Cuba to Miami via the Pedro Pan operation, the boys are thrust into a new world where bullies run rampant and it's not always clear how best to protect themselves. 90 Miles to Havana is a 2011 Pura Belpre Honor Book for Narrative and a 2011 Bank Street - Best Children's Book of the Year. In a haunting yet hopeful novel in verse, award-winning author Margarita Engle tells the story of Antonio Chuffat, a young man of African, Chinese, and Cuban descent who became a champion of civil rights. Asia, Africa, Europe—Antonio Chuffat’s ancestors clashed and blended on the beautiful island of Cuba. Yet for most Cubans in the nineteenth century, life is anything but beautiful. The country is fighting for freedom from Spain. Enslaved Africans and nearly-enslaved Chinese indentured servants are forced to work long, backbreaking hours in the fields. So Antonio feels lucky to have found a good job as a messenger, where his richly blended cultural background is an asset. Through his work he meets Wing, a young Chinese fruit seller who barely escaped the anti-Asian riots in San Francisco, and his sister Fan, a talented singer. With injustice all around them, the three friends are determined that violence will not be the only way to gain liberty. "I find it so easy to forget / that I'm just a girl who is expected / to live / without thoughts." Opposing slavery in Cuba in the nineteenth century was dangerous. The most daring abolitionists were poets who veiled their work in metaphor. Of these, the boldest was Gertrudis G#65533;mez de Avellaneda, nicknamed Tula. In passionate, accessible verses of her own, Engle evokes the voice of this book-loving feminist and abolitionist who bravely resisted an arranged marriage at the age of fourteen, and was ultimately courageous enough to fight against injustice. Historical notes, excerpts, and source notes round out this exceptional tribute. From the National Book Award Finalist and New York Times bestselling author of The Flamethrowers, an astonishingly wise, ambitious, and riveting novel set in the American community in Cuba during the years leading up to Castro's revolution—a place that was a paradise for a time and for a few. The first novel to tell the story of the Americans who were driven out in 1958, this is a masterful debut with a unique and necessary lens into US-Cuba relations. Kushner's first novel is a tour de force, haunting and compelling, with the urgency of a telex from a forgotten time and place. Lolcats. Salsa dancing. Unrequited love. Tom Crosshill's smart and witty debut teen novel treads a colorful coming-of-age journey from New York City to Havana. When Rick Guti#65533;rrez—known as "That Cat Guy" at school—gets dumped on his sixteenth birthday for uploading cat videos from his bedroom instead of experiencing the real world, he realizes it's time for a change. So Rick joins a salsa class . . . because of a girl, of course. Ana Cabrera is smart, friendly, and smooth on the dance floor. He might be half Cuban, but Rick dances like a drunk hippo. Desperate to impress Ana, he invites her to spend the summer in Havana. The official reason: learning to dance. The hidden agenda: romance under the palm trees. Except Cuba isn't all sun, salsa, and music. As Rick and Ana meet his family and investigate the reason why his mother left Cuba decades ago, they learn that politics isn't just something that happens to other people. And when they find romance, it's got sharp edges.